However, there is limited evidence on which kind of community engagement strategies are most helpful in improving the immunisation status of children. The latest National Family Health Survey (NFHS) data for 2015-16 shows that 62 per cent of Indian children aged 12-23 months are fully immunised. Although the coverage has increased by 18.5 percentage points in the past decade, India has a long way to go. To combat this low coverage, the Central government rolled out Mission Indradhanush in 2014. An intensified version of the programme was further launched in select districts and cities to ensure up to 90 per cent coverage by December 2018. The broad strategy involves meticulous planning and involvement of health administration at all levels along with intensive training of the officials and health workers. A key component of this programme is also to build demand for immunisation in communities through a broad range of communication strategies. However, there is limited evidence on which kind of community engagement strategies are most helpful in improving the immunisation status of children. The International Initiative for Impact Evaluation (3ie) is in the process of building global evidence on which innovative programmes work best and under what circumstances. As part of this exercise, four innovative approaches of engaging communities for improving immunisation coverage are currently being evaluated in India. These immunisation programmes have various degrees of community engagement. For example, the community-driven approach in three districts of Assam is based on the premise that communities can think and act for themselves, and have the capacity to bring about change with the help of locally-trained facilitators and using locally-available resources. In Fatehpur district of Uttar Pradesh, educational videos produced by the community on important maternal and health practices are being screened to facilitate more trust and open discussions around a variety of health topics, including immunisation. In seven districts of Haryana, different kinds of information dissemination techniques are being tested ranging from involving trusted and influential community members for spreading important messages on immunisation to sending generic or personalised SMS reminders to caregivers. The study also explores how incentives in the form of mobile recharge can improve the immunisation status of children. 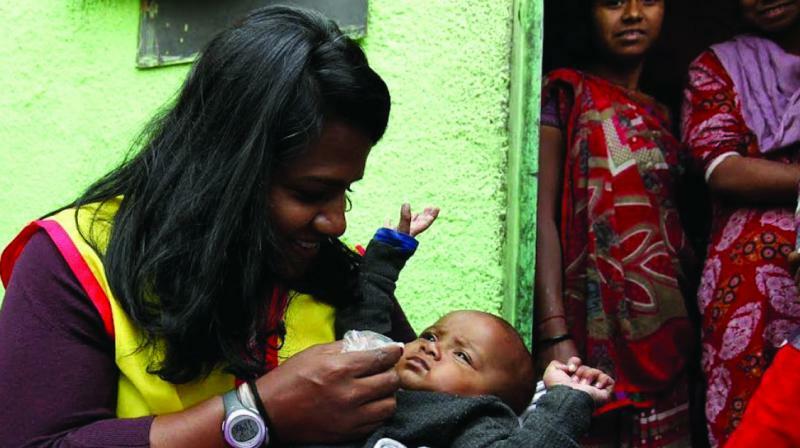 In Udaipur, Rajasthan, the community is being engaged through a visual reminder in the form of a pendant necklace containing a digital chip with the child’s immunisation records. The mothers also receive automatic voice calls in local dialect reminding them to take their child to the next immunisation camp and educating them about its importance. In both these programmes health workers are using tablets to collect and access immunisation data in real time. Engaging communities in the design and implementation of a programme enables a friendly space for discussion and resolution of the community’s apprehensions about immunisation. It also helps researchers to work with the communities in identifying local bottlenecks in the delivery and take-up of immunisation services and finding locally appropriate and feasible solutions. A major challenge for innovative programmes involving technology, however, is the limited literacy and skills of existing health staff. Involving them extensively in the design and development of these technologies, training them throughout the project cycle and providing mentoring can help them adapt to these programmes more effectively. Something as simple as ownership of a phone could be an important factor for proper targeting of technology-based programmes, which should not be overlooked. For example, using SMS or voice reminders to target mothers may sound like a very sensible and straightforward plan but quite often it may not work, as usually it’s the men in the family who carry the mobile phones. Researchers have also taken due note of temporary migration of mothers due to seasonal work, festivals and the traditional custom of child delivery in the parental home which can lead to partial immunisation and incomplete vaccination records. In all these evaluation studies, it is crucial to involve key stakeholders, such as policymakers and programme managers, at every stage to ensure that the intervention fills an important policy gap, reflects the ground realities and enables institutional support wherever required. Ultimately, these studies will inform us which community engagement interventions work, where, how and at what costs to improve the immunisation status of children in India. The writers are researchers at International Initiative for Impact Evaluation.